Regiment/Catrawd: 11th Battalion, Australian Infantry, A.I.F. Service Rank and Number / Rheng gwasanaeth a rhif: Private No. 1056. Military Cemetery/Memorial / Fynwent milwrol: Lone Pine Memorial. Ref No Grave or Memorial / Rhif cyfeirnod bedd: 33. Medals Awarded / Medalau a ddyfarnwyd: 1914-15 Star, British War Medal, Victory Medal. Died of wounds aged 25 years. Harry Oswald Amos was born in Rhyl, Flintshire, North Wales April/May/June 1890. The 1901 Census shows that the family lived at 7 Belle Vue Terrace, Rhyl, Flintshire. The head of the family was Samuel John Amos aged 48, a Book Publisher and Joint Publisher of the Rhyl Advertiser Newspaper. His wife Ann Amos (nee Weldon) and their 8 (eight) children – Emma Weldon Amos aged 20, Ethel Laura Amos aged 18, Reginald Amos aged 16, who was employed as a Solicitors Articled Clerk, Arthur Berwyn Amos aged 14, Samuel Hubert Amos aged 12, Harry Oswald Amos aged 11, John Amos aged 7 and Lucy Myfanwy Amos aged 5 years. Harry was educated at Abergele County School, Abergele, Denbighshire. On leaving school he obtained employment as a Draper with Affleck Brothers, Manchester. He was one of a number of young men at that time, mainly from the Abergele area who made a decision to start a new life in Western Australia and on 6 June 1913, Harry sailed from London (Tilbury) Docks aboard the Orient Line Ship, RMS Orama for Freemantle, Western Australia. He gave his occupation as a Farmer. On arrival in Australia, however, he obtained employment as a Draper and lived at 258 Adelaide Terrace, Perth, Western Australia. On Monday 14 September 1914, Harry enlisted at Helena Vale, Western Australia into ‘C’ Company 11th Battalion, Australian Imperial Force (AIF). He travelled to Blackboy Hill Military Training Camp, which was used to train and house large numbers of troops. On enlistment he is described as 24 years old, 5’8″ tall, weight 9.5 stones with dark hair and blue eyes. A Methodist and unmarried. He gave his mother, Mrs Ann Amos as his next of kin. Australian troops en-route to the Western Front were earmarked for the assault on Gallipoli, along with several British and French Division. Amongst the Australian Imperial Force was the 1st Division and Harry Oswald Amos. Harry had left Australia aboard HMAT Ascaniuson on Saturday 31 October 1914. They arrived in Egypt by February and in March 1915 they were stationed in Lemnos. On Thursday 1 April 1915 orders to prepare an amphibious assault on Gallipoli were received. Training for the attack began. 3rd Brigade, containing 11th Battalion and Harry Amose, would be the spearhead. The ANZAC’s (Australian and New Zealand Army Corps) would land near Gaba Tepe on the Aegean coast, from where they could advance across a peninsula, cutting off the Ottoman troops, in what was a secondary attack to back up the main landings at Cape Helles. The small area in and around which they would land has become known as ‘Anzac Cove’. Following a postponement due to weather, the ANZAC’s came ashore on Sunday 25 April 1915. ‘Two Divisions of the ANZAC Corps landed over 1 kilometre north of their planned objective and in the darkness and confusion of the early morning faced rugged and difficult country. Units mixed up on their arrival rushed inland and became separated from the main force, which came under growing fire from the Turkish defenders. While Turkish reinforcements arrived, the Anzac position became increasingly precarious as the assaulting force failed to secure their initial objectives. Falling back on improvised ans shallow entrenchments the Anzacs held on for a crucial first night. By the first evening 16,000 men had been landed; of those over 2,000 Australians had been killed or wounded’. (The Landing at Anzac Cove, Australian War Memorial). 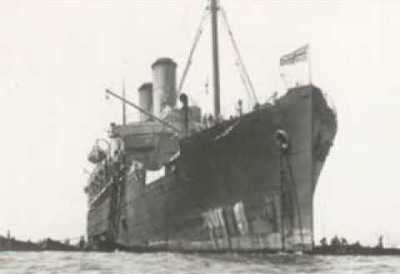 Harry was one of the wounded and was evacuated by one of the boats acting as a floating hospital, H.M.T.S. City of Benares, where he was treated for a penetrating wound to the abdomen. He died at 1.30pm on Monday 26 April 1915 and was buried at sea from on board H.M.T. Seang Choo on Thursday 29 April 1915. The Rhyl Journal – Saturday 8 May 1915 – Headed – Toll of the War. Scarcely a week passes without some Rhyl resident being brought into close personal touch with the great war now raging, for their are many Rhyl lads now serving their country in this great crisis. This week we have received news of the death of Harry O Amos, the fourth son of the late Mr S Amos, a former proprietor of the Rhyl Record and Advertiser and Mrs Amos, Bath Street, Rhyl. After his schooling in Rhyl he was trained for the drapery business under Mr J Talbot. He subsequently secured an appointment in Manchester and eventually made his way to Australia. Responding to an appeal of his country on the outbreak of war he joined an Australian Battalion, which was recently sent to the Dardanelles and there he has laid down his life for his country. Much sympathy will go out to members of his family in their bereavement. His personal possessions were returned to his mother in February 1916. They amounted to a purse containing 3 coins, his identity disc, an ash tray and some letters. 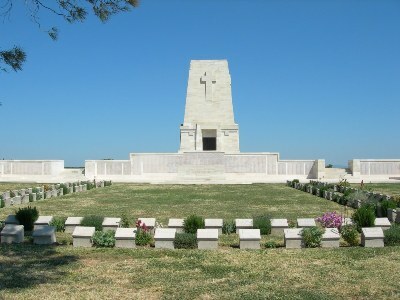 Lone Pine Memorial, which is situated in the Lone Pine Cemetery at Anzac. There is a Flintshire Roll of Honour Card for Harry Oswald Amos at the County Record Office, Hawarden, Flintshire, dated 9 September 1919 and signed Thomas Hughes.